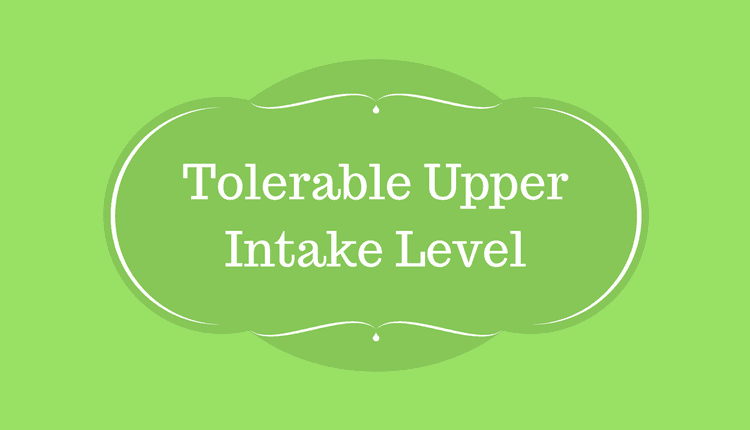 Tolerable Upper Intake Level or Upper Limit (UL) is defined as the highest level of nutrient intake that does not increase the risk of adverse health effects to almost all individuals in the general population. If the nutrient intake increases above the Tolerable Upper Intake Level or UL, the risk of ill-effects on the human body may also increase. In fact, the term’ tolerable intake’ itself indicates that any nutrient intake that crosses this level can pose a risk to the human health. Any intake within this limit can be ‘tolerated’ biologically. The purpose of the UL is not as same as the recommended level of intake. Until now there is no evidence that nutrient intake above the Recommended Dietary Allowance (RDA) or Adequate Intake (AI) is beneficial for human health. The main objective of the UL is to inform the general population about the risks of excess nutrient intake. It is useful because of a rise in the interest regarding the availability of fortified foods and an increase in the use of dietary supplements to meet the nutrient requirement. The UL is based on the total intake of water, nutrients from the food, fortified foods, and supplements. It helps in understanding if any adverse effects are associated with the total intake. If the ill-effects are associated only with the intake of fortified foods and supplements, then the UL is based on nutrient intake from these food sources and not on the total intake. The UL may help in preventing the toxicity of certain nutrients and their undesirable effects on overall human health.